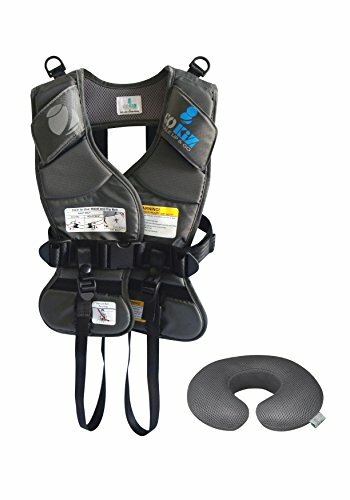 The GOKIZ Car Seat Vest is a seat belt positioning device that lowers the seat belt to the child and properly positions it across the child's shoulder and upper thighs. It is tested according to all applicable aspects of Federal Motor Vehicle Safety Standard (FMVSS) 213 for performance and labeling required for booster seats. A booster seat raises the child up to the seat belt. The GOKIZ Car Seat Vest utilizes the vehicle's existing seat belt system to protect the child, by keeping the seat belt properly positioned and moving with the child. The vehicle's existing seat belt is clipped into place using the seat belt guides on the GOKIZ Car Seat Vest over the child's shoulder and upper thighs, keeping the seat belt on the child's shoulder and off of the child's abdomen. The GOKIZ Car Seat Vest can only be used in vehicles with a lap and shoulder belt. The GOKIZ Car Seat Vest comes in 3 sizes; Small accommodates children between 30 and 60 pounds and between 34 and 44 inches in height. Medium accommodates children between 40 and 70 pounds and between 40 and 50 inches in height. Large accommodates children between 50 and 80 pounds and between 46 and 56 inches in height. Intended for children at least 3 years in age. Tested to meet Federal Motor Vehicle Safety Standard (FMVSS) 213 for performance and labeling required for booster seats. Vest comes in 3 sizes - Small accommodates children between 30 and 60 pounds and between 34 and 44 inches in height. Safe alternative for bulky Car seats and Booster Seats - Great for Travel and Grandparents! Allows 3 children to sit safely and comfortably in the rear seat. Easy to use and comfortable for children to wear - includes anti-whiplash pillow for additional neck support. If you have any questions about this product by GOKIZ, contact us by completing and submitting the form below. If you are looking for a specif part number, please include it with your message.